Nemesis by Jo Nesbø, a Mysterious Review. 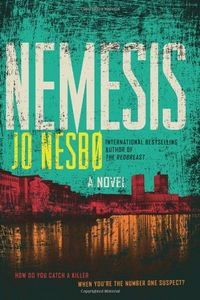 Review: Oslo police detective Harry Hole investigates a series of bold bank robberies and the murder of an old flame (for which he appears to be the prime suspect) in Nemesis, the fourth mystery in this series by Jo Nesbo (but only the second to be published in the US). Harry is barely holding on to his job with the police department. He's very good at what he does, but he also drinks too much. He's currently assigned to investigate a bank robbery in which the thief not only gets away with the cash, but kills a teller in cold blood because her manager took too long to give it to him. Everything was captured on the bank's security cameras, something the thief seems to use (somewhat ironically) to his advantage. Harry subsequently meets up with Anna, an old girlfriend; not exactly what he needs right now, but in a drunken stupor spends the night with her, awakening in his own apartment. She's later found dead, an apparent suicide but Harry thinks otherwise. It soon becomes clear that Anna's death is linked to his other investigation but every step Harry takes seems to complicate his case. Nemesis is a strong plot-driven crime novel, and it's apparent the author is a master in crafting the sophisticated, interwoven plot threads that form the foundation for the book. It's really quite amazing and very cleverly accomplished. Little else stands out, however. Harry Hole is center stage most of the time, but he's not much different from the dozens of alcoholic (or recovering alcoholic) cops that have preceded him. And other than a few mentions of snow (or melting snow), there's scant attention paid to the setting. It could have been set in Canada or Russia as well as Norway. Finally, Nemesis is often not all that easy to follow, and not only because of the intricate plot. Most series books typically don't rely too heavily on previous entries to provide background material, yet there seems to be a basic assumption here that the reader is familiar with not only the character of Harry Hole but also the environment in which he works, the people with whom he associates, and the circumstances that led to him being where he is today. To be sure, none of this information is strictly necessary to enjoy Nemesis but there's a sense that something is lacking, that the book isn't nearly as rich or deep or well-rounded as it could have been. Given that the book is nearly 500 pages in length, a few extra paragraphs here and there to fill in the gaps wouldn't have been excessive in the least. Acknowledgment: HarperCollins provided a copy of Nemesis for this review.